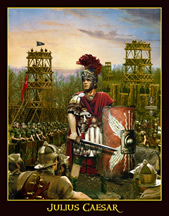 Caesar's Military Leadership helped to change his troops from being rash and loosing their battles to soldiers with uplifted spirits and loyalty to their commanding officer. Research papers on Caesar's military leadership look at the strategy that the leader imparted to win the many wars he engaged in. One of our several military strategist writers at Paper Masters can explain, in a custom research paper, why Caesar was so successful in his military leadership. As a leader, Julius Caesar was masterful at instilling his soldiers with this pride, restoring their spirit when it fell, elevating their self-confidence and selfless devotion to the cause, giving them “fresh heart and hope”, when need be. For example, Caesar warned his troops at Gergovia not to be too over-eager “for battle or hope of plunder”, recognizing the need for a surprise attack and cautious movements. His troops were rash though and lost the battle; Caesar condemned their “bad discipline” and for not listening to the commander-in-chief; he writes, “I want obedience and self-restraint from my soldiers, just as much as courage in the face of danger”. But then he, as a great leader, knew he had to re-build their shattered confidence with new victories, which of course were forthcoming. This same issue once again surfaces when Caesar suffered setbacks in his Greek campaign. He first blamed his troops: “the setback we have sustained is anyone’s fault rather than my own”. But Caesar again understood the necessity for his soldiers to regain their fighting spirit: “so you must make an effort,” he wrote, “to repair the damage by your valour”. As a leader, Caesar was known for his clemency and generosity, using this to his strategic advantage. He often asked that the conquered enemy only surrender their weapons, disband their armies, give over hostages, and end all further and future conflict. The Helvetti, for example, were simply asked to “rebuild the towns and villages that they had burnt”. Also, in the Roman Civil War, captured Pompeians had their lives spared and property restored at Pharsalus, lessening their fear at being captured. And earlier in the civil wars, he had famously handed back the military fund handed over by officials of Corfinium--in an incident known as the “Pardon of Corfinium”; he was neither willing to take away soldiers’ pay, nor their lives. But some of his enemies deeply resented these psychological games: clemency was more a tactic, and more disarming, than anything else. One critic puts it best, “Caesar knew he had enemies, but believed he could break their opposition by continuing to pardon them. It was a contemptuous attitude”. Though pardons were often read as an insult by civilized warriors such as the Romans, Caesar is said to have remarked that he was determined to be “foremost in justice and reasonableness”. He wanted to “not only to excel them in magnanimity, but to overcome them with magnanimity”. Caesar's War on Gaul - Caesar's Wars on Gaul research papers are custom written to illustrate he was both hero of the people and master of the most powerful Roman Army. Marcus Junius Brutus - Marcus Junius Brutus Research Papers look at his role in the stabbing of Julius Caesar. Collapse of the Roman Republic - Collapse of the Roman Republic research papers overview the factors that led to the collapse. Fall of the Roman Empire - Fall of the Roman Empire term papers illustrate that the most important factors in the decline of the Roman military. Order a research paper on Rome from Paper Masters. Paper Masters writes custom research papers on Caesar's Military Leadership and how Caesar restored and elevated the self-confidence of his soldiers.